Gangly men perching on undersized chairs. A hooded figure suffocating his victim. Shooting stars streaking through the night sky. These images remained indelible within an evening brimming with diverse works. Each of the nine pieces presented at Men in Dance invited the audience into its own unique world, accentuating vibrant, athletic, embodied movement. Cheering and applauding, the audience devoured this rare visual feast. Gierre J. Godley’s the home I grew up in, created in collaboration with the dancers of PROJECT 44, utilized undulating turns, twists, and reaches into the outer kinesphere. The four dancers of this New York-based company moved with compelling fluidity, effortlessly skimming the floor and pausing in b-boy like stalls. Their large bodies barely fit onto the minute chairs onstage. The size disparity between chair and dancer visually symbolized an inability to fit within the boundaries and categories of the everyday world. Further reinforcing the theme of not fitting in, the dancers changed their outward appearances as if contending with questions of identity. Revealing their neon pink underwear, the motif of donning and shedding clothing threaded throughout the work. Unfortunately, the downtime of watching the performers put on and take off their tight jeans, sometimes struggling, distracted from the movement portions, which were the strongest aspects of this juicy work. Scotty Flores and Kince de Vera performed Jamie Karlovich’s Providence, one dancer playing a mysteriously masked and hooded force, exacting control over his partner. What began as enabling, helpful support of Flores’s limbs gradually evolved into an inhibiting manipulation as the work progressed. The piece came to a satisfyingly disturbing conclusion when de Vera, cradling Flores’s prone body, pressed his hand over Flores’s airway, as if lovingly murdering him in a sinister exercise of the power that had been building from the outset. Perhaps the hooded figure represented a psychological force, such as a disorder or addiction, that initially seems benign, but grows into a destructive influence on the victim’s psyche. Karlovich’s Providence succeeded in containing a fully abstracted narrative arc and also remained open to metaphorical interpretation, a feat seldom accomplished by short works in a festival format. Closing the Glass Door, by Randy James of the New Jersey-based company 10 Hairy Legs, showcased the exquisitely trained and well-paired Robert Mark Burke and William Tomaskovic in a contemporary ballet duet. The two men wore black mesh leotards created by Abraham Cruz that both exposed their well-toned physiques and signaled the work’s revealing, intimate subject matter. The two men alternately fought and embraced, as if living out or recalling a series of disputes and conversations between lovers. The men grappled, using visible effort to throw each other into the air and across the stage, their anger reflected in the passionate and fiery violin score by Haendel-Halvorsen Pascacaglia. With each new violin movement, a new phase of their turbulent relationship played out. In the final moment of their duet, the fervent tone of the work suddenly fell away as one dancer tenderly laid his head on the other’s shoulder, suggesting that all quarrels were forgotten and they were safe in each other’s arms. Mike Esperanza’s Backbone, created in collaboration with the dancers, wrapped up the evening. Although the work featured the largest cast—five men—the piece’s contemplative mood made it a questionable choice as the festival’s closer. Esperanza dedicated the work to his father, according to the program notes, so when one dancer performed a solo wearing a long white diaphanous robe that another dancer made float above the floor, angel wings immediately came to mind. In addition to the wings, the piece also incorporated a flashlight and numerous swaths of white fabric that were thrown across the stage like shooting stars. The overuse of props and special effects, however, stole focus from the dancers’ efforts. Although a touching and thoughtful requiem, Backbone teetered on the edge of melodrama, especially compared to the many other works on the program that were more focused on visceral, pure dancing. 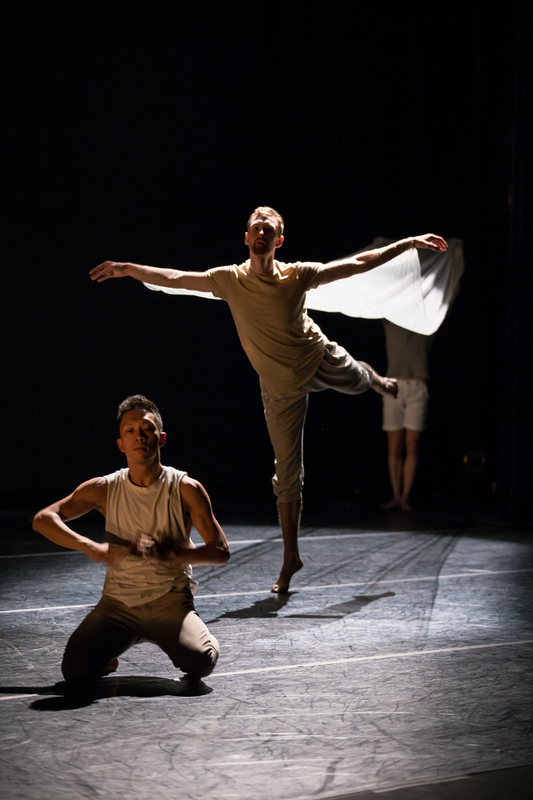 Also on week two of the festival’s program were works by Seattle choreographers, including two duets by Bryon Carr and Anna Connor, and a quartet by Daniel Costa. Jason Ohlberg created a solo on Scotty Flores, and Alex Allan, originally from Australia, performed an arresting aerial solo dangling from a rope high above the stage. It was a pleasure to see Seattle’s local dancers and choreographers holding their own in a festival drawing talent from across the United States. This biennial festival, its 11th since foundation in 1996, celebrated the bi-coastal talents of male and female choreographers, whose male dancers excelled in the evening’s offering of visceral works. 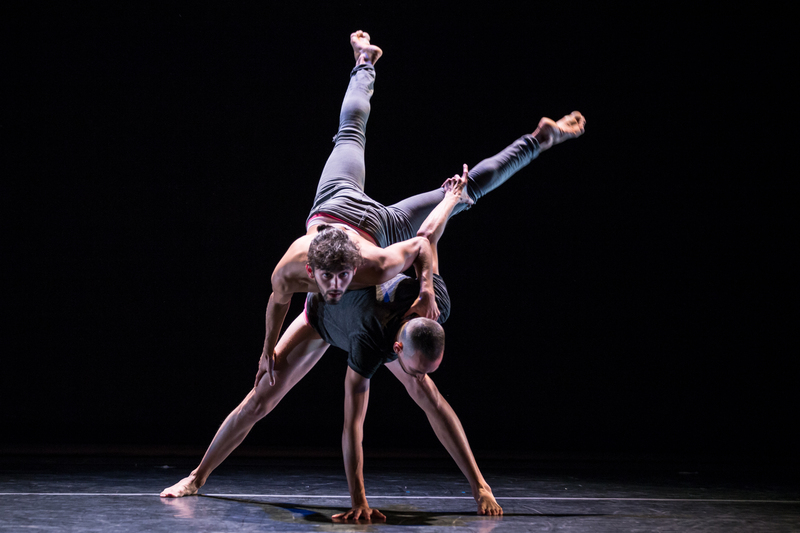 Week II of the Men in Dance: Against the Grain festival was presented at Broadway Performance Hall on October 7-9. For more information on Men in Dance, please visit HERE. Excellent review of an evening of powerful, engaging dance.